Healy makes the play feel unusual by staging it in the round and having the lights on through the performance. It’s a very bare bones set, just the stage with a few strings of light bulbs overhead, so it doesn’t feel particularly theatrical. It felt more like a lecture theatre. As they arrive, some members of the audience are given a slip of paper with a number and a word or phrase on it. When Thomson says a number whoever has it reads what’s on their paper. Audience members are also chosen to be a vet, the father, a teacher, a professor, and a boyfriend. They all do fine jobs. Thomson plays an unnamed character who, at seven, starts making a list of the things that bring them joy and make life worth living. Ostensibly they’re making it for their mother who tried to kill herself but I think the list is actually for them, to give them comfort. It’s a gratitude list writ large. The play was written by Duncan Macmillan with comedian Johnny Donahoe and it’s funny. Not roll-in-the-aisles funny, but warmly funny. There’s a lot of music, a lot about records, and about using the music someone is playing as a key to their mood and whether or not to approach them. Funny or not, this child had a tough childhood with a depressed mother and an emotionally distant father. For about the first half of the play we don’t really learn much about the character – the one on stage or the ones off stage – the play is about the list. Then they go to university and life changes. So does the play. It’s less about the list and more about the character as they meet someone, fall in love, get married, get depressed, and so on. 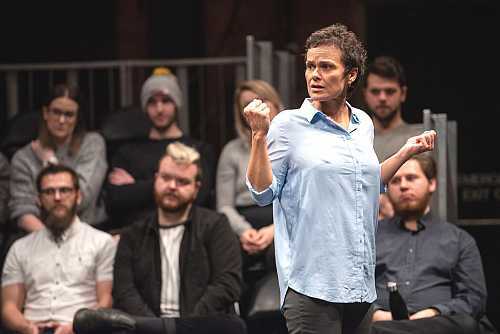 The thing is, the play only deals with depression and suicide tangentially which can be a good thing or a bad thing (or even a ‘so what’ thing) depending on each person in the audience. The play is about the list. Thomson is terrific. She’s relaxed and seems to be just talking with the audience, rather than to them. She’s believable at all stages of the play, as a seven year-old, as a teenager, as a woman dealing with depression. Her ad libs flow easily into the dialogue. The audience members that she worked with seemed at ease and she made sure that the pace she set worked for them. She really made audience participation look appealing (almost). Of course I was sitting safely in the balcony. That might have coloured my opinion. My friend Marg and I both really enjoyed the evening. Marg made an interesting observation. Having the lights on really changes things. You don’t have the experience of the lights going down and the play washing over you, enveloping you. It’s true. It’s a different experience. I wonder what it will be like on other nights. There are usually a lot of theatre people, including actors, in opening night audiences. That makes me think that the bar gets set pretty high for audience participation performances. I wonder what’s it’s like on regular nights. My only quibble is that I found it difficult to hear some of the play. Sometime it was hard to hear Thomson but more often it was hard to hear the ‘volunteers’. To be expected I guess. I’m getting older and some or them were probably pretty nervous. Every Brilliant Thing is a delight and a reminder to see the joy in our daily lives. Highly recommended.